Maintaining Upholstery Car Seats clean is not always an easy task specially if we have kids and pets. It is very common nowadays that people spend more and more time in their cars. We travel longer hours to work, kids school pick ups / drop offs and it is no surprise that we sometimes have our meal while commuting. 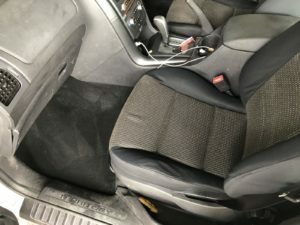 Most of times the result is dirt upholstery car seats and carpets as the photo shows. 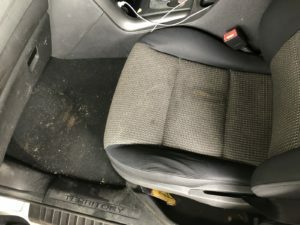 So how can we maintain our car upholstery and carpets clean? Vacuum your car often. Vacuuming your car seats and carpets will help you to keep them clean most of the times. Vacuuming regularly will remove debris and other dirt preventing things from getting stuck in the upholstery and carpet. If you have lots of activities involving food in you car, consider getting your car vacuumed every week, Sometimes twice a week depending on how much you use your car. Try not to leave the dirt or food for too long. Can I Clean spills and other stains? Yes!! The best way to keep stains away from your Upholstery car seats is to clean up all spills as soon as it happen. Keep in mind, the sooner the better. Set strict rules for your vehicle. Ask your friends and family to check their shoes before getting on board. Ask then to eat and drink before or after the journey. Explain that you concerned about stains on your upholstery. Invite them to help you with the cleaning process.